Three weeks after the the Domodedovo bombing, there are few signs that any significant changes to improve security in Russia are in the works. Three weeks after the bombing of Moscow’s Domodedovo airport, the Kremlin is increasingly impatient with the inaction of its security agencies. This visit wasn’t the first time Medvedev has expressed frustration over the past two weeks. The president has already sacked top officials in the transportation branch of the Interior Ministry as well as certain officials within the FSB for negligence and corruption. Russia has already committed enormous sums to the fight against terrorism, mainly directed at major military operations. According to statistics published by the country’s Anti-Terrorism Committee last October, in 2010 Russian Special Forces killed 301 terrorists and arrested another 468 during some 4,500 raids against extremist groups. In reality, the Domodedovo tragedy was only the latest in a long line of such acts. Since 1999, Russia has suffered many deadly bombings, including two planes destroyed in mid-air, explosions on trains, in the Moscow metro, and hostage takings that have ended in bloodbaths. Authorities can at least boast that they’ve identified the enemy. Following the 1993 and 1999 conflicts between Russian forces and rebels in Chechnya, the Chechen war spilled over its original borders into many areas of the North Caucasus. Russian police and civilians are regularly targeted in attacks in the region. Doku Umarov, the self-titled Emir of the Caucasus and leader of Chechen Islamism separatists, has claimed responsibility for the majority of attacks against Russian civilians, including the Domodedovo attack. In early February, Umarov promised a “year of blood and tears” and said he had 60 suicide bombers volunteers ready to sacrifice themselves for his cause. How much presidential anger will it take to defuse the suicide bombers in the Caucusus? 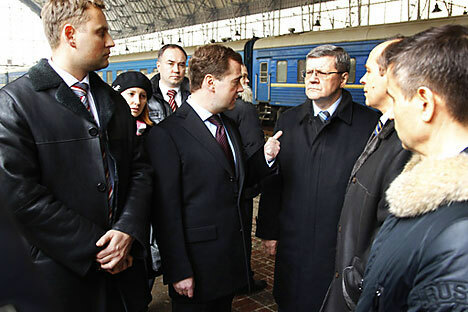 After the attack, Medvedev said that terrorism remained the “main threat to our security” in Russia. But the country still seems to hesitate when it comes to evaluating its own internal security priorities. In fact, terrorism was ranked 10th in overall threats in the military’s official doctrine published in February 2010; NATO took the first place.